The weigh-in can be viewed here, via Channel 3 News. 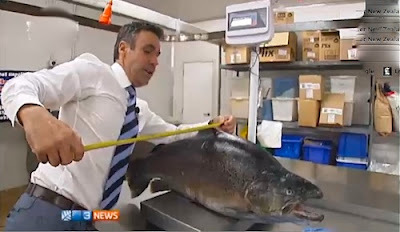 The Channel 3 News report states that the fish is three pounds short of the world record. However, that report is erroneous as the International Game Fish Association, which keeps world records, lists a 41-pound, 8-ounce brown trout as the all-tackle world record. 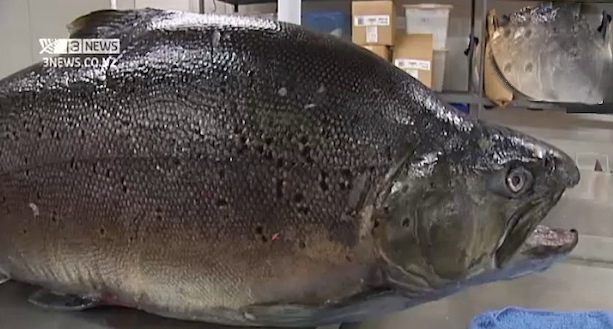 That specimen was pulled from Lake Michigan in 2010. If Kandolf submits his catch to the IGFA, and it’s approved, Kandolf will be recognized as the world-record holder. The trout measured 36.6 inches long and 10.6 inches wide. Apparently it got so plump, and heavy, by feeding on pellets that drifted downstream from the salmon farm. Kandolf plans to have the catch mounted to hang on his wall.